Everyone associates South Wales with coal, and it is mined here because of a massive syncline which dominates the geology north of Swansea. This trough of down-warped rocks preserves in its core rocks of the Upper Carboniferous; these are rich in beds of coal, and they have given the name to the period in which they were deposited. Swansea sits on the southern limb of this syncline, so the rocks dip to the north. As is the case with synclines, the older rocks crop out around the edges, and thus Gower rocks are those which are emerging from beneath the Coal Measures on this southerly limb. The hinges of these folds lie roughly east-west, just like the hinge of the coalfield itself, and this shows that the pressure during the mountain-building phase was coming from the south. So Gower displays a transition-zone between the broad and open style of folding in the coalfield and the tight, narrow folds of the Bristol Channel. The section in Figure demonstrates this in simplified form. You will notice in this diagram that some of the shortening of the rocks has taken place along a fault-line, where one mass of rock has ridden up over another. This is a reverse fault, and there are many examples to be seen. They tend to run parallel with the hinges of the folds, as you might expect. They are called 'thrusts' in Gower, though this is not strictly correct usage of this term. The oldest rocks cropping out on Gower represent the latter part of the Devonian period. They only occur in the cores of major anticlines. At this time, Gower lay in a region of sediment-laden rivers crossing a wide plain between mountains to the north and the sea, which at that time lay over Devon. These mountains were made of still older rocks, and their roots now form much of central and north Wales. The climate at this time was tropical, possibly monsoonal, and the choked streams carried sediment from the intense erosion taking place in the hills. Much coarse material was dropped en route, on the riverbanks and in the islands that split the streams into many minor channels. In Gower, we see pebbly rocks (conglomerates) at the top of the sequence overlying coarse sandstones. The sea at this time began to rise relative to the land, and, as the Carboniferous Period began, the wide coastal plains of the Devonian were drowned. This was an example of a marine transgression, and on top of the continental conglomerates, marine shales (dark, fine-grained friable rocks) were laid down. Then, gradually, the water became clear; the amount of detritus reaching the area from the land was drastically reduced, and limestones began to form. Britain was passing the equator now from south to north, and in the present-day ocean it is principally in such equatorial latitudes, in areas where sediment-supply is low, that limestones are being made. In the clear water calcium carbonate (lime) can precipitate, aided by the abundant life forms that secrete shells and skeletons. Without land-derived sediment to dilute them, these shells can form rocks in their own right, although many limestones are composed of microscopic particles of lime, called lime-mud. The Carboniferous Limestone in Gower is about 800 metres thick, but traced northward, it can be seen to grow progressively thinner. Each individual unit becomes narrower, and there may also be some units missing. This suggests that the sea further north, being nearer to the land, was shallower and subsiding less quickly. Also, minor fluctuations of sea level could mean that in these shoreward areas, sedimentation could be interrupted more frequently, so resulting in omitted units. There are many different units making up the Carboniferous Limestone, each with differing texture, thickness, fossil-assemblage, and so on. These differences were the result of subtle environmental changes, which we will touch on when we visit the localities. Not one of these little changes, however, was as severe as that which marked the complete end of limestone deposition in this part of the world. During the Lower Carboniferous the forces which were eventually to fold and fault the rocks of Gower were beginning to flex the crust of the Earth upwards. This gave added impetus to erosion on the landmasses, which resulted in turn in river deltas swamping the limestone sea with detrital sediment. The water over Gower at this time was relatively deep, and fine shales with marine animals preserved in them were deposited. This time-period is called the Namurian. The stage was now set for the deposition of the Coal Measures, which are the sediments of a widespread system of river-deltas close to sea level, upon which grew the lush forests of giant mosses, horsetails and ferns which eventually became coal. The Coal Measures therefore consist of sandstones, shales and coals arranged in repeated sequence, which tells of how forests grew, were buried by shales as the land subsided and then by sands as the rivers built out. On top of the river-sand, soil developed and eventually the forest became established all over again. So the cycle went on, bestowing upon Wales the mineral wealth which made it the birthplace of British industry. After the orogeny, which took place about 280 million years ago? The rocks were eroded away as the great cycle of geological history repeated itself. More seas entered the area, more sediments were laid down over the eroded remnants of the Devonian and Carboniferous, and yet another orogeny (not so severe in Britain) folded the rocks. But no trace of these later rocks can be seen in Gower, except for one small patch of Triassic sediment in Port Eynon. The Gower holds a unique place in the history of research into the Welsh Quaternary. The last major episode to affect Gower was the Great Ice Age, which occupied the last 2 million years of Earth history. The climatic changes of this period put the finishing touches to the topography of the peninsula, at a time when man was first making an appearance upon it. The generally flat topography of the limestone areas of Gower is evident. The Bishopston and Pennard valleys (left) are two of the larger meltwater channels on Gower. Complete inundation of South Wales by ice during the penultimate glaciation has been widely suggested. Although it is generally agreed that the last glaciation was less extensive than the preceding one, there has been controversy concerning its limits, stemming mainly from the lack of clear geomorphologic evidence and the dearth of datable material. Geologists have suggested that landslides or rockfalls initially dropped the rocks on top of glacial ice. The glaciers continued to move, carrying the rocks with them. When the ice melted, the erratics were left in their present locations. The distribution and provenance of glacial erratics are of importance in archaeological studies, because erratics provided a potential source of raw material for stone implement production. The Gower Peninsula has been occupied since before the retreat of the last Ice Age (Devensian Glaciation), therefore the landscape is full of ancient sites and historical reminders. 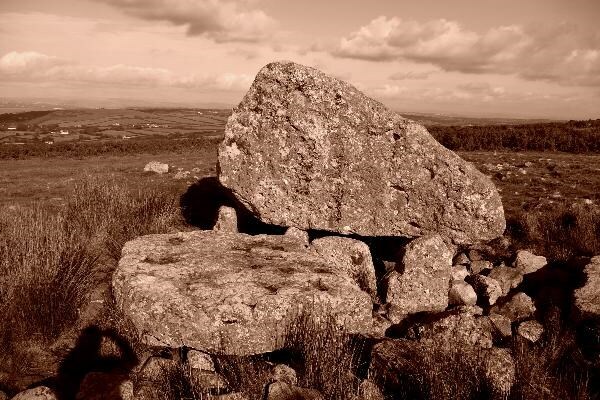 Arthur's stone became a cap stone over a Neolithic burial chamber, which was presumably dug underneath the erratic boulder), possibly coming into contact with ice flowing from west Wales from the right). This latter ice stream impinged upon west Gower, at Broughton and Llangenydd. The glacial erratic was not actually raised - the _______ uprights that form the chambers being inserted beneath it as a hollow was dug out. Please EMAIL me the answers ~ From the guidelines: You do not need to wait for permission to log. Requiring someone to wait is not supported by the EarthCache guidelines. You should send your logging task answers , then log the EarthCache. When I review your logging task answers, if there is a problem, I will contact you to resolve it. If there is no problem, then your log simply stands. Don’t include the answers in your log even in an encrypted form. 2 How many stones still support the big rock and how many others are visible?